Trapeze Harnesses, Hiking Pants, etc. 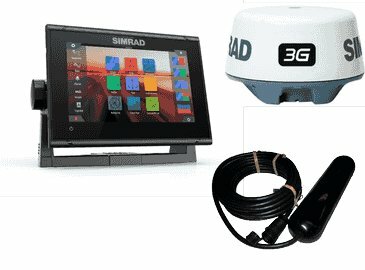 The Simrad GO7 XSR chartplotter navigation display is a perfect way to expand the capabilities of sportboats, cruisers, and smaller center consoles with plug-and-play support for Simrad Broadband Radar™ and Halo™ Pulse Compression radar systems. 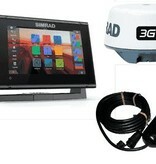 Behind a super-bright, multi-touch widescreen display lies a built-in GPS receiver, wireless connectivity, and industry standard NMEA 2000® networking. Connect with smartphones and tablets, control your onboard sound system, monitor engine data, and choose from an array of built-in sonar technology to cruise with confidence and find fish like a pro. Automatic routing brings the convenience of in-car navigation to boating, helping you to plot a route and get underway with less delay. Simply select a destination, and your display will suggest the shortest, safest route. This feature is available with Navionics+ or Navionics Platinum charts (Navionics Dock-to-dock Autorouting), and C-MAP MAX-N+ charts (C-MAP Easy Routing). * Automatic routing features are unavailable in North America.